I am a real conservative when it comes to printing. Not conservative in a political or religious way… but in an environmental way. In my family we reused as much as possible. This is a photo of my cousin JC’s drying rack. 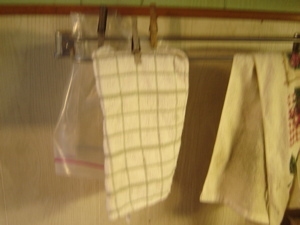 He washes and reuses the ziplock bags multiple times (I love how he hangs them to dry) (the photos a little blurry). I try to reuse as much as possible. At work and at home. This week I got to reuse in the best way. A client had sent out 150 save the dates. They were 100% tree free or recylced based on what we could get paper-wise because she has a big commitment to conservation as well. Of those sent, she had the wrong addresses for 6 people, so the save the dates came back to her. Instead of resending out new save the dates, requiring me to make up some more from scratch, she brought the returned ones back to me and I printed new envelopes and reused those perfectly good save the dates. Now, I know that this form of reusing seems fairly simple and obvious. But I have been working at this career for 5 years now, and I can only remember a couple of other times when I did this. Sometimes reusing returns is necessary because we run out of whatever it is that is being sent (same as this case). But running out is actually directly related to being a conservative printer. I can’t stand wasting paper so I don’t usually print many over what is ordered. And this client’s decision to bring the save the dates back so I could reuse them, well, that’s a testament to her commitment. For the record, when I do have extras, I try to reuse those as make-ready for letterpress or for the big scrap bin for making valentines, birthday cards or other crafty things. Here’s a photo from a mess in my apartment floor from the “sometimes annual pre-valentine’s day ice cream social” that I have so my friends can make art with the year’s printing leftovers. Can you tell I was the president of the energy club in high school?? I also represented the energy club in the beauty pageant when I was 14. I am not posting that picture, though. No Way! I will tell you that it was a really big pink puffy dress…. Someone should reuse that thing for a big tablecloth and matching napkins. This entry was posted in art, invitations, paper, printing, recycling, wedding invitations and tagged envelopes, Letterpress, printing, Recycled, reusing, wedding invitations on January 23, 2009 by tinypine. One day, a month or so ago, I got this little prize in the mail. It was so sweet and thoughtful to for once receive a piece of paper art from friend Adam Myers, working as a business called Black Feather out of Maine or where ever he happens to be vagabonding around. He can make just about anything. He seems to be focused on making useful things like this envelope…. he probably created it because he needed an envelope to send me a check for his business cards. He didn’t mess around. Naturally I took a closer look because I felt a little outdone for a moment and discovered that he had a couple of layers of a wood catalogue of some sort that he pasted together. The frame around my address is pure genius, I think. It is quite petite in size… always right up my alley (TINY pine?). I have to admit that of all people, I am experienced with testing the postal service by placing stamps and addresses in rule breaking places. But I have never done a complete reversal of sides. Adam is adventurous and clearly thinks he is above the law, but it got here! I mean, I probably wouldn’t stamp my credit card bill on the wrong side, but here’s proof that it WILL get there…. eventually, anyway. Now, I know everyone is going to want to start sending me cute pieces of mail to write about… feel free, but go to my website and send it to my office address, will ya? Oh, here is the business card / logo I designed for him. This entry was posted in art, family, paper, postage, Uncategorized and tagged Adam Myers, Black Feather, envelopes, mail, stamps, vintage on January 17, 2009 by tinypine. I got back from the holidays in Southwest Virginia and in my mail box was a familiar envelope with familar handwriting. I was really excited cause it was heavy and that meant there was a prize inside…..
Lori D had sent me some silkscreen postcards that she made on the Print Gocco. She is brave for using that little machine for many reasons… Mostly because they can be very very tricky, but also because it’s nearly impossible to get the supplies anymore (they are from Japan and don’t have distribution, I don’t think…) She did two colors on one screen with this print, which is an amazing part of the Gocco… The little tricks. and it is small for small paper projects. OOH!! You Gocco! Since she sent me 5 of them, I get to give them away. But that is going to be a tricky decision because they are so precious… I guess having that it is a good problem to have… who to give the pretty cards to?? Oh, and they were for Happy Solstice. Which is also very cool. truly. This entry was posted in art, paper, printing and tagged animation, Lori Damiano, printing, silkscreen on January 6, 2009 by tinypine.